The Signal Editions Poetry imprint of Véhicule Press is happy to announce that the First Series of the Signal International Broadsides is now complete. The Series consists of ten broadsides of poems, by ten acclaimed poets, in limited edition, letterpress format on fine paper. The first series is comprised of poets from Ireland, Scotland, England, the United States, and Canada. The Oxford English Dictionary defines a broadside (also known as a broadsheet) as "a single, unfolded sheet with printing on only one side." Originating in 16th century England as a means for distributing political and religious announcements, broadsides also became a means for publishing English ballads (see Bodleian Library Collection). According to the Encycopedia Britannica, the broadside is "prominent in the history of literature because during the later part of the 17th century, several important poems by Dryden, Butler, and others, originally appeared printed on the 'broad side' of a sheet." The Signal Editions International Broadside Series is proud to continue the long tradition of publishing fine handcrafted broadsides. 3) Carol Ann Duffy (published March 2003). A) THE POEM: The poem is printed on an 11"x 15" sheet of ivory-coloured, handmade paper from Papeterie St-Armand. Handset and printed on letterpress by Pierre Filion in Goudy typeface with a coloured title. Numbered 1 - 50. B) STANDARD: The poem, with a single-colour illustration, on a 15"x 22" sheet of ivory-coloured, handmade paper from Papeterie St-Armand. Handset and printed on letterpress by Pierre Filion in Goudy typeface. Numbered 1 - 50. Signed by poet and artist. C) SPECIAL: The poem, with enhanced illustration, on a 15"x 22" sheet of white handmade paper from Papeterie St-Armand. Handset and printed on letterpress by Pierre Filion in Goudy typeface. Illustrations individually handpainted by the artist. Lettered A-Z. Signed by poet and artist. Of this edition, only letters K-Z will be offered for sale as single sheets. 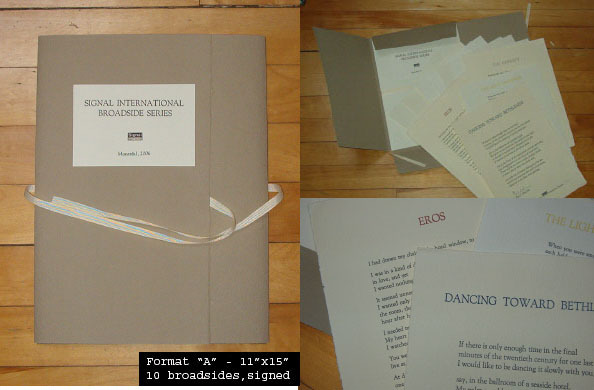 D) THE SERIES: Complete sets of the ten broadsides in each format in fine handmade portfolios are now available. Click here to see portfolio set A, and click here to see portfolio sets B and C.